This is a compilation of some of the frequently asked questions(FAQ) regarding LISTSERV, for more information maintaining a list, please see the "Guide to Understanding and Managing a LISTSERV mailing list". How do I request a new listserv? I don't remember my password for LISTSERV. How can I reset it? I currently own a LISTSERV list. How do I change the owner? Can a LISTSERV list have more than one owner? I don't know who owns a particular LISTSERV list. How do I contact the owner? Why is our LISTSERV list not listed on the public list? I sent an email to our LISTSERV list, but I haven't received anything. Is the list working? We have a new list, but when I try to send an email to it I get a "5.1.1 illegal or unknown alias"
How do I add or remove subscribers to a LISTSERV list? How do I add or remove many subscribers to a LISTSERV list at one time? How do I delete a LISTSERV list? How Do I Enable UTF-8 Compatible Headers in LISTSERV? How Do I Set a Footer(Bottom Banner) in LISTSERV? How Do I Set a Mail Template in LISTSERV? 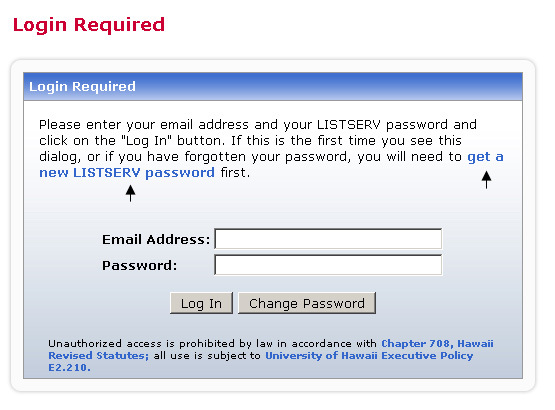 Login to the LISTSERV request page at http://www.hawaii.edu/its/listRequest with your UH Username and password. Follow the directions on the page. You will need to supply the name of the list (must include a hyphen), a description of the list, and choose your list's configuration settings. 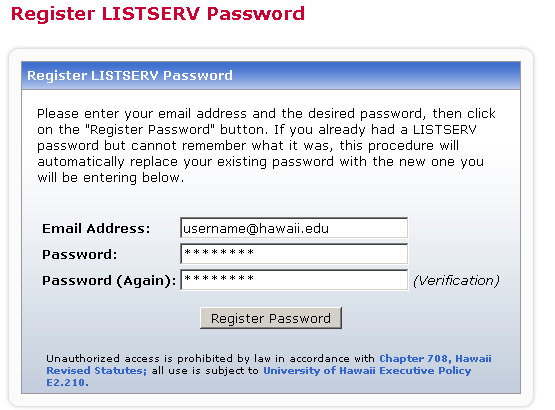 From the main page (http://listserv.hawaii.edu), click on "Log In"
On the Register LISTSERV Password page, enter your complete email address (e.g. 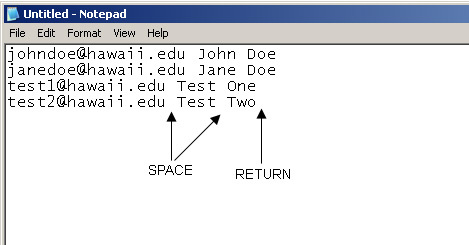 username@hawaii.edu) and your new password in both password fields, then click on "Register Password". 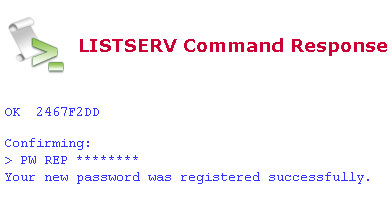 You should now see a Confirmation Sent page, continue to the final step to confirm your new password. Check your email for a message from LISTSERV with a subject line of "Command confirmation request". Simply click on the link to confirm your new password or copy and paste the link into your browser window. You should see that "Your new password was registered successfully". Note: If you do not confirm within 48 hours, your request to register a new password will be cancelled and you must start a new request. 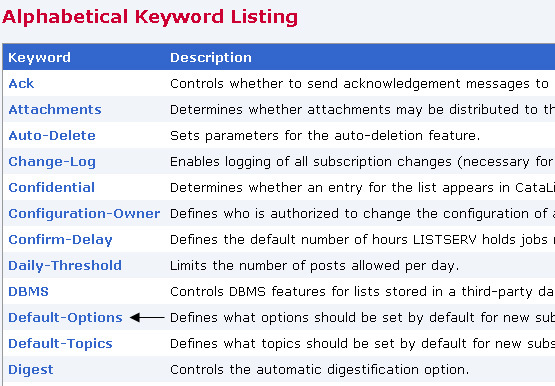 From the menu select "List Management", then "List Configuration", and finally "Alphabetic Keyword List". 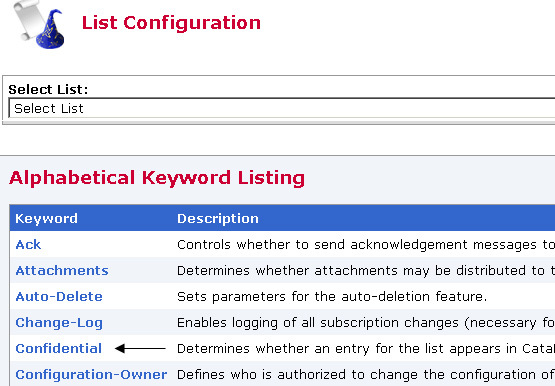 On the List Configuration page, first select the list that you are modifying, then scroll down and click on "Owner". Note: If you only own one list, it will be selected by default. Enter the email address(es) of the new owner(s) one address per line, review the address(es) entered for typos and click on "Submit" when done. Any owner listed under "Quiet:" will have list management rights, but will not receive any delivery error or administrative mail from LISTSERV. Note: 1) If you are removing yourself as an owner, once you click on submit you will immediately lose access to manage the list. Be sure this is what you want to do! 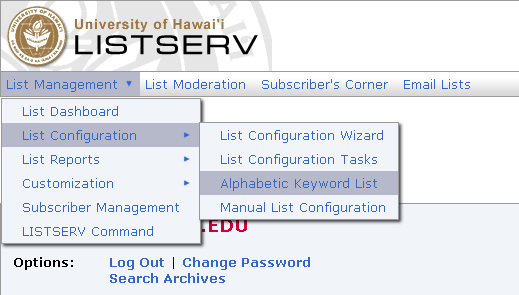 2) Only the listserv site administrator can add other lists as owners of a list. Yes, unlike a mail alias which can have only one owner, LISTSERV lists can have multiple owners. Enter the email address(es) of the new owner(s) one address per line, review the address(es) entered for typos and click on "Submit" when done. Any owner listed under "Quiet:" will have list management rights, but will not receive any delivery error or administrative mail from LISTSERV. Note: If you are removing yourself as an owner, once you click on submit you will immediately lose access to manage the list. Be sure this is what you want to do! 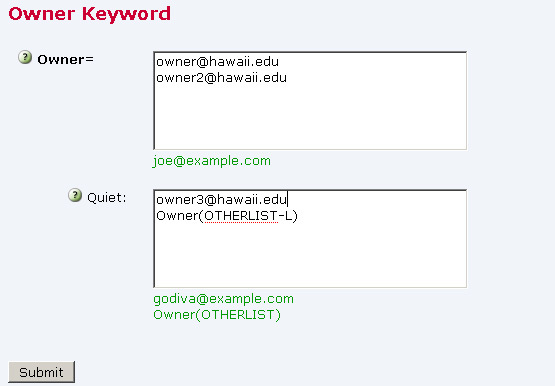 To contact the owner(s) of a LISTSERV list, send an email to listname-request@lists.hawaii.edu, where listname is name of the list in question. 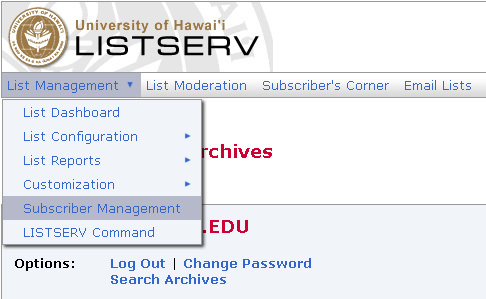 For example if you want to contact the owner(s) of the list LISTSERV-L@lists.hawaii.edu, you would email LISTSERV-L-request@lists.hawaii.edu. To display your list on the main page, you need to change the "Confidential" setting. On the List Configuration page, first select the list that you are modifying, then scroll down and click on "Confidential". Note: If you only own one list, it will be selected by default. Using the drop down box, select "Service" and click on "Submit". 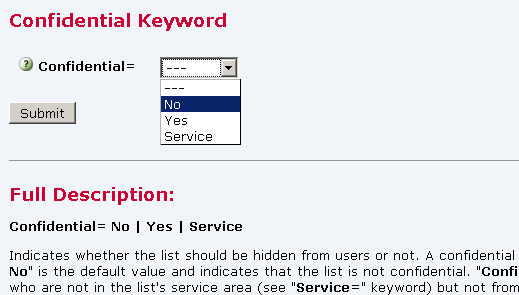 (You may also select "No" if you want the list to be displayed on the L-Soft Global Lists) Note: Use of the confidential setting does not safeguard your list other than removing/displaying your list on the index of lists. Click on "Email Lists" in the menu, which will take you back to the main page. You should now see your list displayed on the main page. a. change the settings for any current subscribers. b. change the default-options so all new subscribers inherit the new setting. a. ACK An acknowledgment of their email, in which the sender receives an email from the LISTSERV that their message was sent to X number of recipients. From the menu select "List Management", then "List Reports", and finally "Subscriber Reports". 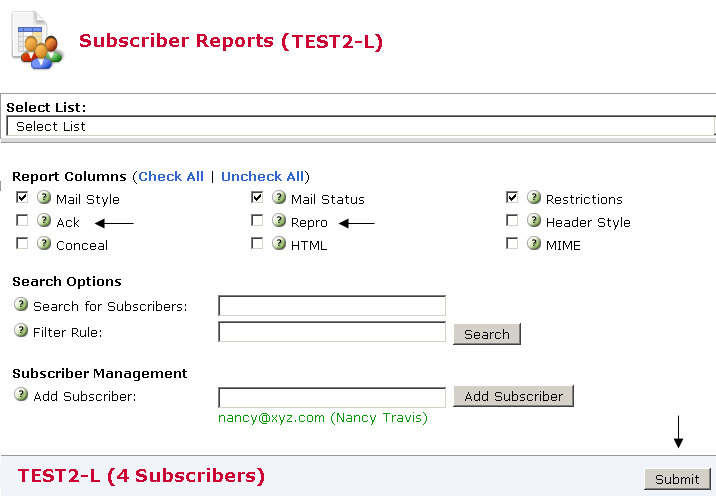 On the Subscriber Reports page, check both "Ack" and "Repro" under Report Columns and click on the "Submit" button. Use the check boxes on the left to individually select subscribers and the drop down box on the bottom of the column for either "Ack" or "Repro", then click on "Submit". To quickly set options for all subscribers, do not select any of the check boxes for an individual, select the option "Check All" as shown below. On the List Configuration page, first select the list that you are modifying, then scroll down and click on "Default-Options". Note: If you only own one list, it will be selected by default. Add the keyword ACK or REPRO in the field, then click on "Submit". If there are already other default-options in the field, simply add a comma to the end, then add the keyword ACK or REPRO. If you are correctly addressing the list (don't forget that all list names have a hyphen in them), then there may have been an error in the list creation process. In this case, please contact the ITS Help Desk at 956-8883 (neighbor islands toll free at (800) 558-2669), email help@hawaii.edu or use the form at http://www.hawaii.edu/its/contact. From the menu select "List Management", then "Subscriber Management". To add a subscriber, in the field below "Add New Subscriber" enter the subscriber's email address optionally followed by their first and last name. You may also select whether or not the subscriber receives an "Email Notification", when done click on "Add to listname". 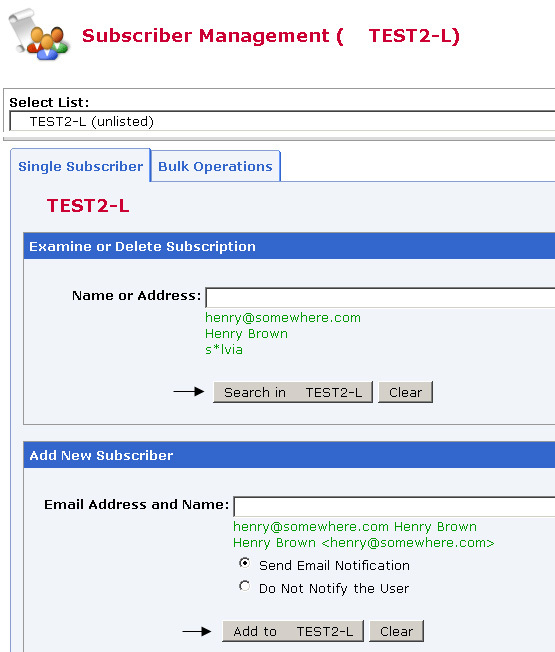 To delete a subscriber, in the field below "Examine or Delete Subscription" enter the subscriber's email address then click on "Search in listname". On the "View or Set Subscription Options" page, click on "Delete". To use the bulk operations feature, you will need a plain text formatted file with one email address (and optionally followed by the first and last name separated by a space) per line. Each line or entry must be separated by a carriage return. You can use programs such as "Notepad" or "Microsoft Word" but you must save the file in plain text (*.txt) format. On the Subscriber Management page, click on "Bulk Operations"
Click on "Browse" to navigate to your plain text file to import from, or type of the path of the file in the field "Input File:". Select the proper function (add/remove/etc) and click on "Import". Once the page reloads, you should see a status message that confirms the number of additions or deletions as shown below. If you receive an error, double check the location of the file and the format of the file itself. 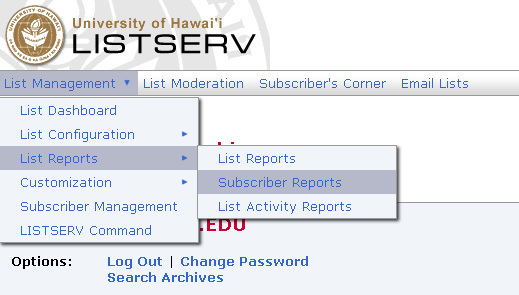 If you are the current owner of a list, simply email help@hawaii.edu from your @hawaii.edu account with the name of the list that you would like deleted. The request may take 1-2 working days to complete. 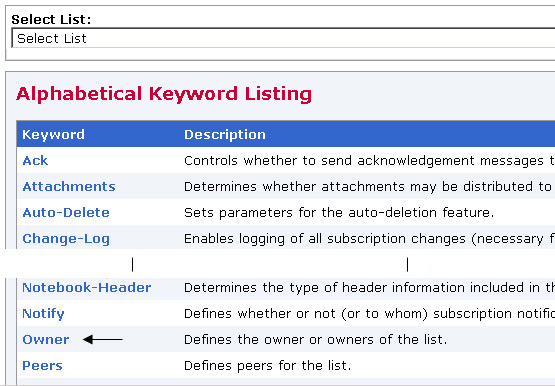 From the menu select List Management, then List Configuration, and finally Alphabetic Keyword List. Scroll down and click on Misc-Options. Use the drop down box to select the list (for owners of multiple lists) and enter UTF8_HEADER in the field for Misc-Options=. Click Save. On the upper right corner, LISTSERV should display UTF-8 next to the mode. Bottom Banner Templates allow you to include a footer on each message sent to a list. The DEFAULT_BOTTOM_BANNER and DEFAULT_BOTTOM_BANNER_HTML templates provided in LISTSERV 16.x include a SIGNOFF link that subscribers can click on in order to easily unsubscribe from a list. An example is provided below. Lists created from LISTSERV 16.x already have the bottom banners enabled as default. To enable the banner for older lists, you will need to copy the contents of the DEFAULT_BOTTOM_BANNER and DEFAULT_BOTTOM_BANNER_HTML to the BOTTOM_BANNER and BOTTOM_BANNER_HTML templates, respectively. From the menu select List Management, then Customization, and finally Mail Templates. Choose Top and Bottom Banners from Select Template Category and click on Select. Choose DEFAULT_BOTTOM_BANNER and click on Edit Template. Select and copy the entire Contents: field. Go back on your browser and select the BOTTOM_BANNER template. Paste the Contents: field and click Update. Repeat Steps 3 and 4 but with DEFAULT_BOTTOM_BANNER_HTML and BOTTOM_BANNER_HTML to copy the HTML version of the template. In LISTSERV 16.x, you can create or select a HTML template that applies to informational messages from the LISTSERV processor. This template does not modify the content or create a theme for mail sent to a list nor the newsletter feature that is new to LISTSERV 16.x. An example of the system message is shown below. Under HTML Mail Template Gallery, click on the Select button for the template you would like to set for your list. Your current selection will be reflected on the Mail Template Style box on the right. In this example, the default is TEXT/PLAIN and the selected is BLACKGRANITE. 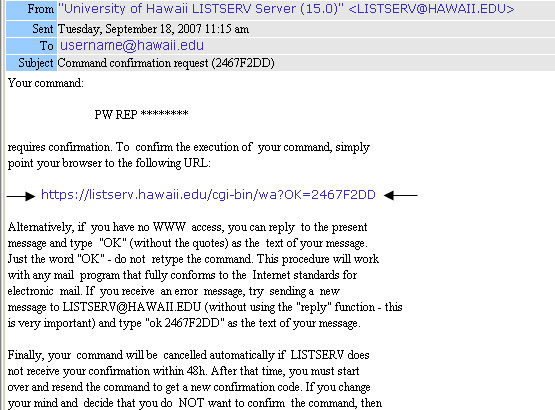 You can test by adding/removing a subscriber or any other command that generates an informational message from LISTSERV.